From studying behaviour to designing the A.P.T. The study of animal behaviour is essential in order to understand why some installations are unsuitable and how to create solutions. By observing the activity around wildlife crossings, which are very common in Alsace to enable animals to cross the barriers that roads create, researchers deduced that these installations are ineffective for small animals, and can even be dangerous. 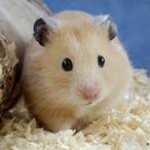 Could there be a way to enable these small animals to cross barriers while reducing the risk of predation? The idea was to design a system that could be incorporated into existing wildlife crossings. A tube that the animal could use to cross while feeling safe, or at least take shelter in the event of imminent danger. This was the subject Yves Handrich’s team worked on within the LIFE Alister project (M. Tissier, J. Jumeau & Y. Handrich, CNRS-DREA, Life ALISTER, 2013-2017). 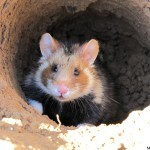 The tube’s diameter was a suitable size for European Hamster crossings, with lateral openings to enable these prey animals to enter the tube at any moment during the crossing. The A.P.T. (Anti-Predation Tube) was tested in laboratory conditions, both with and without confrontation with a live predator (mobile or immobile). It was also tested in a wildlife crossing where both ends were fenced in. 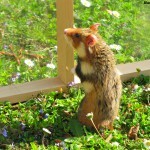 The European Hamsters lived there in comparatively wild conditions. As these animals quickly return to their behaviour in the wild, this situation means they can be observed in a near-natural environment, such as it would be if they were in the wild. Cameras and camera traps in the tunnel meant researchers could study the animals’ behaviour while they were crossing the tunnel, as well as in the presence of a predator; the predator used was a house marten, in a cage of course. What are the results of these tests today? 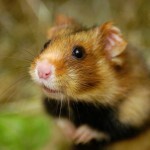 The question of the future installation of APTs inside wildlife crossings in areas where hamsters are present will be put to the DREAL Route (Regional Department for the Environment, Planning and Accommodation) during the next NPA (National Plan of Action) in favour of the European Hamster.